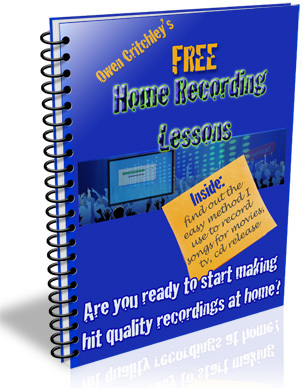 method that I'd like to get you started FREE"
My award winning Easy Home Recording Blueprint"
In these lessons you'll learn my "simple, perfect method"
to begin making pro quality recordings at home. I know when you see how easy and affordable professional sounding home recordings can be, you will want to get started right away. Are you ready for your music to "stand up and stand out? My life as a major label artist who records music for movies, tv, cd release etc in a simple home studio, gives me rather unique qualifications to share my knowledge with you. I'd like to get you started right now, free of charge, so you can record your music right at home... faster, way cheaper and simpler. The Easy Home Recording Blueprint methods are the game-changer you've been looking for to finally take your music career to the next level. You Will Receive the First Lesson in Your Email Inbox Immediately. Privacy Assured: Your email address is never shared with anyone. We'll get started as soon as you sign up. I'll talk to you soon! record professional quality sound at home."